Premium font bundles are my weakness. They’re just such good value, especially when you consider that one typeface alone can cost $20-$50+. And this Influential Font Lover’s Bundle is no exception! 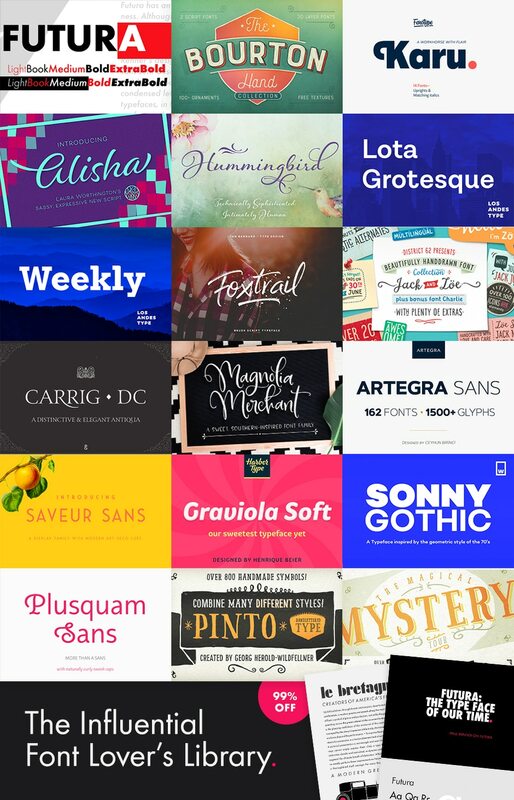 In this hand-selected bundle, are 17 influential typefaces (470 fonts in total) which usually come to a total of $3465, however you can get them at 99% off for a limited time only, making the bundle just $29! This is crazy good value, especially when you consider that Futura (one of the most successful fonts of all time) and the trendy Bourton Hand are included inside, along with a huge variety of other styles including modern sans fonts, hand-drawn fonts, display fonts, brush fonts, serif fonts and scripted fonts. 17 best-selling, versatile and exceptional font families (featuring a total of 470 individual fonts), perfect for adding professional typography to your design work. The quality of this collection is superb. Each family includes a wide range of supporting weights, giving you ultimate creative choice. Details such as the kerning, baselines and letterforms have been meticulously refined, by some of the font industry’s biggest foundries. Enjoy a huge array of language support as well as tons of creative extras. These fonts have never been discounted to this extent, in fact, you’ll be hard pressed not to pay hundreds of dollars for some of these individual families. This is an exclusive offering at Design Cuts, and a once in a lifetime opportunity to own all of these game-changing font families as part of one affordable collection.